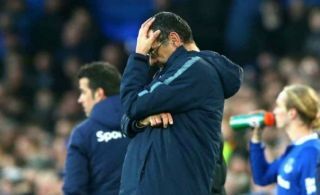 Chelsea manager Maurizio Sarri is the overwhelming favourite to be the next Premier League manager to be sacked as odds are updated for the international break. The Daily Express have reported that Chelsea chief Roman Abramovich could pull the trigger over the international break after the latest blow of the 2-0 defeat to Everton. The Italian tactician has not been at all convincing since moving to Stamford Bridge from Napoli in the summer, with the Blues looking up against it in the race for a top four place. And according to Ladbrokes, Sarri is now odds-on to be the next Premier League sacking, with the bookies offering just 4/7 on his dismissal. He’s the only odds-on manager on the list, with the next closest being Everton’s Marco Silva at 4/1. By comparison, the managers at Chelsea’s big six rivals look very comfortable, with Arsenal’s Unai Emery priced at 100/1, Tottenham’s Mauricio Pochettino 125/1, Manchester United’s Ole Gunnar Solskjaer 150/1, and both Jurgen Klopp and Pep Guardiola 200/1.